Ascent Guide: Christian Hasler jr.
Named for: The mountain is #10 in the Valley of the Ten Peaks. "Wenkchemna" is the Stoney Indian word for "Ten." Wenkchemna Peak lies to the north of Wenkchemna Pass and is really just a shoulder of Mount Hungabee. 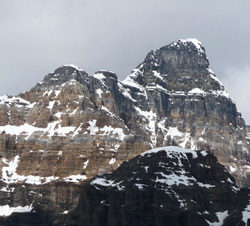 Norman Collie and others have speculated that Samuel Allen, who initially named the Ten Peaks, may have regarded Mount Hungabee as #10.